Burma: back to square one after two decades of cease-fire? 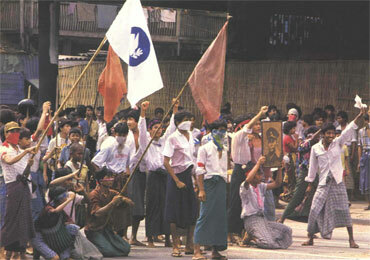 Student demonstrators during the 1988 Burmese uprising, in which hundreds of students and citizens were gunned down by the military. Twenty-three years after this incident, what do we have now? Some analysts say there has been some progress as a result of last year’s national election, while others say we have got nowhere. This is because there are different views on the new military-dominated civilian government and their 2008 Constitution. In fact, the student protestors’ dream of a “student union” has not materialized. Instead, student leaders, including Min Ko Naing of the 88-generation students group, are still behind bars. They did not obtain “democratic rights.” The glint of hope for democratic change – when in 1990 the Aung San Suu Kyi-led National League for Democracy won 82 per cent of the vote––evaporated after the results were quashed by the military regime. Today, many activists are in jail, forced labour continues, child soldiers remain, and the press censorship machine grinds on. Out of the three demands of the 8888 uprising, only the collapse of the BSPP has come about. Even then, this appears to be a façade. A clone of the BSPP was born in recent years called the Union Solidarity Development Party (USDP). The USDP won 85 per cent of the 1,100 seats in parliament, in many cases based on so-called advance votes, plus 25 per cent of the seats were reserved for the armed forces in the November 2010 elections. A retired general, Thein Sein, was elected president of the new government. Retired general Shwe Mann is parliament speaker, while all of the ministers in the states and divisions are controlled by the USDP. After 23 years, however, the challenge does not only come from Aung San Suu Kyi but from the guns of the ethnic armies that signed cease-fire agreements with the Burmese military in 1990s. This is because there are different views on new government and the new Constitution, particularly who will control the ethnic armed forces. Fighting has broken out again along the Burma-Thai border and Burma-China border with ethnic organizations struggling for self-determination including the Karen, Shan, Mon and Kachin armed groups. In this context, the All Burma Students' Democratic Front (ABSDF) or Student Army that was founded after the 8888 uprising in Thai-Burma border area joined with the Democratic Karen Buddhist Army (DKBA) and with the Kachin Independence Army (KIA) was soon fighting against the troops. Although many of their members moved to third countries for a new life, hundreds are still in the border regions. "We very much welcome the ABSDF," Colonel “Moustache” of the DKBA told this correspondent. Although the students are not that numerous, they can be relied on for political force, public support, contacts within the country and international connections and media penetration, he said. Meanwhile, on the dialogue front, Aung San Sue Kyi met with government minister Aunt Kyi in Rangoon on 25 July. Although they did not announce details of the discussion, a week later Suu Kyi sent an open letter to President Thein Sein, with copies to the Kachin, Shan, Mon and other ethnic groups, offering to help with a dialogue between the ethnic groups and the government. All ethnic groups welcomed Suu Kyi's proposal but there’s been no response from the Naypyitaw authorities. The ABSDF looked on approvingly at the uprisings in the Middle East and has been waiting for the shockwaves to strike and spread through Burma. It is hard to say whether the students are hoping for the impossible. They also admired the bombing of Libya by NATO forces and the rebels’ occupying of the country bit by bit. How close to reality is their hope? How much can the Burmese people do? It would be interesting to see what the views of the NLD and other political parties would be, and the response from the international community. Whatever it is, the political situation in Burma hasn’t improved in the 23 years after the 8888 revolution but has deteriorated to a point where gunfire can be heard again. Htet Aung Kyaw was a student activist involved in the 8888 uprising and the ABSDF. He is now a freelance journalist and writer based in exile.